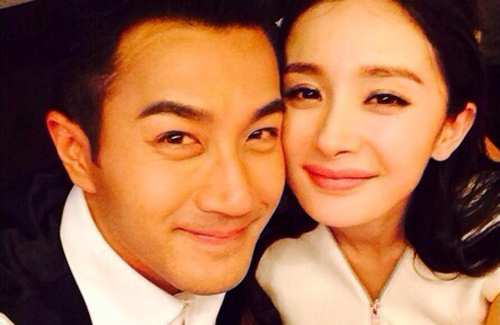 In January, Hawick Lau (劉愷威) announced that his wife, Yang Mi (楊冪) is pregnant. Completing Tiny Times 3.0 <小時代3> last week, Yang Mi can finally take a break. She is approximately five-months pregnant and starting to show her belly bump. This week, Yang Mi was seen at the Shanghai airport with her assistant. Her pregnancy bump was already noticeable under her loose sports jacket. Though pregnant, she went through the security x-ray machine without fretting. Hawick who is currently promoting his new drama, revealed that Yang Mi has become gentler and more adorable ever since she got pregnant. He shared happily, “Although she used to have these silly smiles, she is doing that more often now. The feeling is really great!” Expectant mothers are not the only ones in which parental instincts kick in early. Admitting that his paternal instincts have already started, Hawick now finds himself with a brand new motivation to work harder. Asked about the gender of the baby, Hawick did not want to directly answer the question but once again hinted that like all fathers, he hopes to have a daughter. At the same time, he is afraid the baby girl will turn out to look like him, which will then make her look odd. Hawick’s father, actor Lau Dan (劉丹), will be given the honor to choose the name of his grandchild. Her face look so skinny now, I thought pregnant women usually gain it on their face first. With all the plastic work these two have done to their faces, looks like two teenagers with stretched faces. Doubt the kid will look like either one of them. That picture is lol!!!! They look like a couple of goblins with pointy ears, pointy noses, big mouths and bug eyes. Bad pic! Did both of Hawick and Yang Mi alter their faces again recently? Yang Mi was a really cute child star at age 4 and doesn’t look too different from the way she looks as an adult. thats how PS makes $$$$… as long the their inner beauty is so genuine sweet and not fake as outer apperance.. I don’t think their PS matters as even before PS, they were pretty above average looking…so their child shall be fine. Lol. That pic is soooo frigging cute!!!! It shows how close he is with his father. I like this pair. He is obviously smitten with her and she with him. Just curious; usually what month can see baby bump? 5th month is a bit too late even more so when Yang Mi isn’t exactly big size. Yea,I feel he is really close to his father. I think he and his father are so sweet and he is truly lucky to have such a good father. Depend on the person really. As my SIL was really skinny and you can’t tell she was pregnant until she was 6 1/2 months pregnant. Then she got really big at 8 months. As for me, I already look pregnant when I was 4 months as I was chubbier! I want to age naturally and do not want to use Botox or anything because it is not good for your health and long term beauty. I also do not want my face stiff because I love to smile and all. Me too but only because I can’t afford it. For me it us not because I can afford it or not. I do not like to use unnatural means just to look better. I am also a big chicken and am afraid of needles,so no way would I want a needle to poke into my face. I actually did hear about that on Entertainment tonight and it freaked me out. Wow celebs do not only spend money but go through so much pain for beauty. I am personally too chicken to do so even if I had the money. Long term health is better than long term beauty? If I just physically looked good but did not physically feel good then there is no point in looking physically good. I think it’s OK to do PS and botox as long as one don’t overdo it to the point where they end up looking uglier then before. So if one have money and want to enhance their look, I don’t see why not? Especially, if it can help their career and change their life. Oh well, you win some, you lose some. They do look pretty happy together. lucky baby to have good parents and grandfather. I like the pair. Very cute couple.